Home » Everest » Everest News » 2016 Edition: Nepal to Limit Everest Climbers through New Rules … Again! 2016 Edition: Nepal to Limit Everest Climbers through New Rules … Again! For those of you who follow Everest, each year the Nepal government announces new rules to make Everest safer and less crowded and safer. Thus it is time for the 2016 edition as announced in the newspaper The Himalayan Times from our good friend Rajan Pokhrel. These are similar to one announced last year but there is a thought that they could go thru this time because, believe it or not, the government is more stable. In looking at the 2016 edition, there are a few problems. While I agree requiring prior experience on a 7000m or better yet an 8000er would be the way to reduce crowds and improve safety, it cannot be enforced in an environment of money grabbing and summit frauds. Also, the way this new law is written, if you summited K2 in Pakistan or Cho Oyu in Tibet but not a mountain in Nepal, you would not be able to get an Everest permit because it would be required to have summited an 7000er in Nepal. Also, the fact that every Sherpa is called a Sherpa Guide is misleading … The term Guide has real meaning and is backed by international certifications. calling everyone a guide is disrespectful to the certified guides who spent years and tens of thousands of dollars to achieve that live of expertise. I certainly hope that if any of these ideas are put into ‘law’ that giving the Sherpas summit certificates passes as the current law does not give Sherpas certificates because they are “not part of the expedition”. That law was written in 2002 but this clause was not enforced until 2016 so all the Sherpas who summited this year have not received summit certificates. As for the disabled climber, Nepal would be better served to focus on the inexperience as the 28 climbers classified as disabled in the Himalayan Database thru 2015, 11 summited (out of 7,001 total summits) and 2 died. The Nepal Ministry of Tourism announced a proposed, note the word proposed, set of new regulations for Mt. Everest to address growing concerns of crowding and safety. Certainly any effort to make Everest less crowded and safer is good but the Nepal government has a history of announcing such measures and not following through or enforcing the regulations. The main problem with these frequent announcements is that the government has been very unstable for years with almost an annual turnover of Ministers who are responsible for managing the mountaineering and tourism industry. Also, corruption is rampant. It is reported that each Minster takes a personal part of the permit fees, then leaves office. When the next official takes office and wants a cut of the financial action, new fees must be imposed. This explains why extending climbing permits after difficult years (2014 and 2015) is such a major problem. Nepal is reported to take in over $360 million from the tourism industry. Everest permits alone are $4.5 million with additional income to hotels, guides, porters, transportation companies and more. Disabled or visually impaired people need someone to carry them. Only those who can go on their own will be given permission. For reference, Everest is actually one of the safer 8000 meter mountains with 282 deaths against 7,001 summits. The Nepalese side has seen 4,421 summits with 176 deaths through August 2015 or 3.98% while the Tibet side has seen 2,580 summits with 106 deaths through August 2015 or 4.1%. And historically, it is getting safer. From 1923 to 1999: 170 people died on Everest with 1,169 summits or 14.5%. But the deaths drastically declined from 2000 to 2015 with 5,832 summits and 112 deaths or 1.9%. This is not the first time broad and loud announcements have come declaring the government’s intention to take control of the climbing scene. Each one is accompanied with an excellent press release quoting multiple government officials, as well as Nepal climbing companies, stating they will never compromise on the new rules and will have zero tolerance with respect to enforcement. Looking at the last three years of negative Everest publicity, the age or disability measures would not have stopped the deaths. None of killed were under 18, older than 75 or disabled. In my view these recent deaths were caused by natural incidents and being in the wrong place at the wrong time, thus had nothing to do with mountaineering experience. Perhaps the experience requirement would have reduced the number of overall people on the mountain thus reducing the people put at risk. The only announcement that was made and actually implemented was the increase of life insurance for Everest workers. It was raised to $15,000 against the wishes of other ethnicities across Nepal. The Ministry of Tourism and Aviation either knowingly or unknowingly has become an expert at manipulating the media to parrot announcements making the public believe real changes were implemented. Most journalist simply take what they are told, create a sensationalist headline and move on to the next story. I actually believe there are good intentions behind a lot these ideas, just a poor understanding of the real problem and real-world solution. If you look at age and disability limits, the people that would be impacted represent a tiny fraction of both climbers and deaths. Once again, the announcement is more of a public relations move than a real effort to address the root problems. Of note, since 2010, climbers from the Tibet side must be between 18 and 60 to be issued a permit. There has not been a significant reduction in deaths with these age limits since then. Very qualified disabled climbers including Mark Inglis (leg prothesis) and Eric Weihenmayer (blind) have summited Everest with proper support. This year, Japanese climber, Nobukazu Kuriki was welcomed by the same Ministry as he attempted to summit Everest in the autumn season. Kuriki lost nine fingers in a previous Everest attempt and would be considered “disabled” by many. No climber under 18 or older than 75 has ever died on Everest from either side. As for disabled, the Himalayan Database shows Phur Yemba Sherpa in 2014 and Thomas Weber in 2006 as being disabled and dying while on Everest. The other proposal was to require Everest climbers to have climbed a 6500 meter peak before given an Everest climbing permit. Overall I think this is a good idea. I’ve long advocated that all Everest climbers have prior experience on an 8000 meter mountain. For the record, I reached 8000 meters on Cho Oyu prior to my first Everest attempt. However this requirement would eliminate Denali at 6194 meters and virtually all the popular Nepal trekking peaks (Mera at 6476m, Island at 6189m, Lobuche at 6119m). It’s unclear if the applicant would have had to actually summit or just go on the climb. Also, unclear is if there would be any provisions allowed if the weather or mountain conditions stopped them from summiting. A good idea but difficult to implement. A few guides have recently increased their requirement to have experience on an 8000m mountain, for example Cho Oyu (8188) or Manaslu (8163). Many guides accept Denali and Aconcagua (6980m) as sufficient experience for Everest. The experience requirement is desperately needed. In my own observation on Everest this past spring (2015), many young climbers proudly boasted their only experience as being on Kilimanjaro, a walk-up at 5896 meters. If it was implemented on both sides of Everest (Nepal and Tibet) this could drastically increase safety and reduce crowding. The primary issue with the 6500m requirement is fraud during the application procures. And therein lies the real issue. Anyone can claim to be a guide and take a person’s money and apply for a permit. They can misrepresent their member and there are few ways to prove their experience claims. The old school western guides have dealt with his for a long time and ensure most of their members are qualified. Also they usually have a large presence on the mountain to react to emergencies. The new young guide companies or low costs outfits are my biggest concern. They employ Sherpas who may have little experience on Everest who have little climbing training or experience, virtually no medical skills and sometimes poor language skills to communicate with non-Nepali members. It was common to see Sherpas getting basic climbing training this spring on Everest which brings up the question if the new regulations would apply to Everest workers as well as members? The low costs guides, often provide a minimum amount of oxygen, offer basic foods that results in members losing too much weight. They do not use professional weather forecast and depend on “word of mouth” of when to go to the summit. And finally, they allow inexperienced climbers to roam the mountain on their own with no radios or ability to track them. 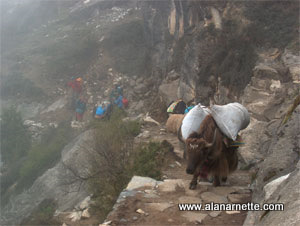 The bottom line is that too many members simply pay their fee, go to Everest assuming someone will take care of them. This is the root of the problem with both crowding and safety. With these announcements, I wonder if even more climbers and guides will shift to Tibet. This has been a much talked about trend after the 2014 deaths in the Icefall. While often threatened, few actually make this move as Nepal is known to more politically stable, the route is considered slightly easier, the infrastructure more established than on the Tibet side and the Khumbu trek life changing. Also, many Sherpas enjoy the added benefit of taking a quick break back to their home village in mid season – not possible on the Tibet side. While the age requirement is not a huge issue, anyone can get around them with the right connections, the experience requirement might cause individual climbers to consider Tibet. This could be a self fulfilling prophecy with respect to safety as more inexperienced people climb from Tibet where helicopter rescue is unavailable, guides often charge very low prices and provide low levels of support thus creating a more dangerous environment with increased crowding. Overall, Nepal could actually make Everest more dangerous with these rules if China does not go along. This attractive offer brings some people who may not fully understand what climbing at 8000 meters is all about, unprepared to be self sufficient if disaster occurs. I believe the basis of safety and crowding issues lie with inexperienced climbers that are enabled by poor operators and guides. The inexperience shows up in slow climbing, ignoring health issues and taking unnecessary risks to achieve the summit. There are too many operators who will take on a member regardless of their experience in order to boost their s. They will tell the member about extra Sherpa support, the number of times their Sherpas have summited and sell them a low price expedition that is filled with shortcuts. The member, eager for their chance, will hear what they want to hear, ignoring all the warning signs; even the history of rescues, shoddy logistics, broken gear and perhaps deaths attributed to that operator. An official clearing house of incidents would be useful to identity the suspect operators. The long lines are more complicated. The trend on Everest is to increase the Sherpa support as way to encourage climbers who may think they are not ready. The members should listen to themselves more closely. The long lines are usually due to one or two slow climbers. It is often difficult to pass another climber on Everest, especially if they are already tired or a Sherpa is carry a huge double load. The obvious solution is tighter vetting of members as to their skills, capabilities and experience. This could be done through the Nepal and Tibet permitting process, but corruption is an ongoing problem as is simply falsifying an application. I don’t think leaving vetting solely to the operators will work as some will ignore the risks to get the business. Of note, many reputable operators regularly turn away members only to see them on the mountain with someone else. Another option is to limit the number of permits issued each year. On Denali, there is a limit of 1500 permits each season, which has never been reached. But again, corruption is a real problem and an Everest permit would have real value. For Everest both of these options would require cooperation on both sides to achieve the goal of increasing safety and prevent switching to the side with the looser permit process. However, I am not sure if it would reduce deaths given that most of the recent deaths have been caused by altitude related issues, that are not easily screened out before a climb, or from mistakes made during the climb such as not clipping into the safety lines. If safety is the top concern, then requiring a climb of Nepal’s Manaslu (26,759’/8,156m) or Tibet’s Cho Oyu (26,906’/8,201m) would be good step. This would increase the chances that an Everest climber would have experience to select an appropriate guide service. Also they would have an increased understanding of how their body reacts to extreme altitude. It would also give them a solid basis of skills and experience to handle potentially similar conditions that they would face on Everest. To encourage climbers to make this investment, perhaps a discount on the Everest permit price would work while maintaining the same level of permit revenue by having applicants climb two mountains. It would most likely increase the overall money brought to the country through porters, teahouses and other support functions. Finally it would reduce the number of people who climb Everest for bragging rights thus attracting more qualified climbers. Many operators ask (not require) for climbs on other peaks such as on Denali or Aconcagua to demonstrate skills. So could these climbs accomplish the same objectives? I don’t think so. Those mountains, while difficult in their own right, are not 8000m mountains or have the complexity of a two month expedition. Can Everest be made safer? I don’t know, the same way I don’t know if Mont Blanc, Denali, Aconcagua or any mountain in Colorado or France can be made safer. This season, there have been multiple deaths on 8000m mountains other than Everest. In the end it sometimes comes down to luck and not being in the wrong place at the wrong time. But not being put in that position often is the personal responsibility of the individual climber. You cannot make a mountain safer but you make climbers better. As an inhabitant of S.E. Asia, I can tell you for a fact that these rules will either not be enforced, or there will be plenty of corruption and bribing behind the scenes. What are your opinions of the technical difficulty or Cho Oyu and Manaslu? Which Guide service would you use for Everest?